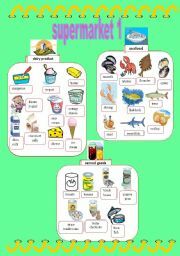 Different kinds of food you can find in supermarket or somewhere else.This can be a vocabulary exercise for students or food pictionary for teachers.Key is included. Hope you like! 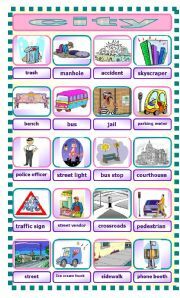 Some compounds nouns about the city and traffic.You choose the correct words for the pictures. I included keys, too. Hope it´s useful! 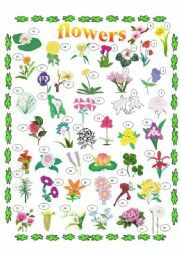 Worksheet´s about flowers. Some common flowers and uncommon flowers are included. This can be an exercise or a kind of material for teachers. Hope you feel interesting! 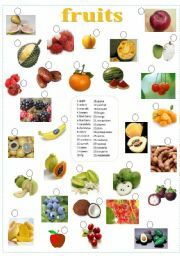 The worksheet is about fruits. 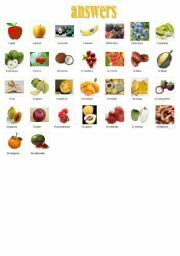 There are 30 kinds of fruits with pictures. 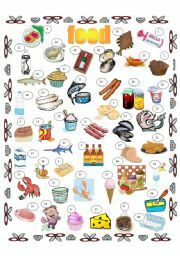 You have to choose the right word for the picture.Hope you like it!I have already sent the answer worksheet. Some items you can buy at the supermarket. 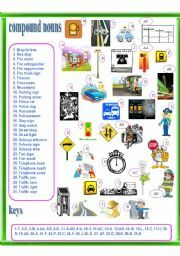 The vocabularies are divided into different categories. Because of the size I cannot make all categories appear on one worksheet. I will send "supermarket 2,3". Hope you like!